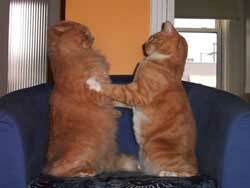 You would think that introducing cats to each other for the first time would be a relatively simple thing. After all, the domestic cat is a friendly soul, who likes nothing more than to greet everyone he meets with a gentle head nudge, right? Well, not always I'm afraid. Although some cats can live quite happily with other pets, it does very much depend on the individual cat and how they have been brought up from birth as well as their own personal temperament. There are never any guarantees that two cats or other pets will get along and harmony within the household may become a thing of the past in some cases. How Introducing new cats without the fur flying is doable. 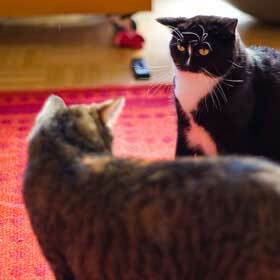 How changing the home environment can help new cats to get along. Find out how a cat may perceive other animals and how they react to them. Why some cats get along and other do not. The whole process of introducing cats to each other has to be done slowly and carefully from the very beginning. If not, then the whole situation can become much worse and you may find that you have two cats that try to attack each other whenever they come into contact. This may even lead to a situation where it is safer and fairer to have one of the cats re-homed. 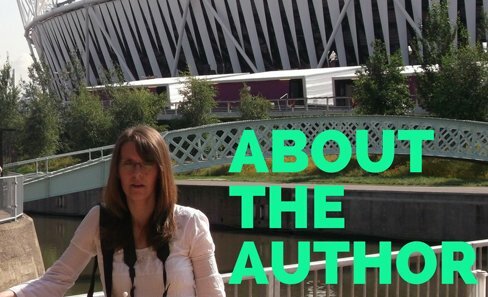 The process of introduction can take from anywhere between three to four days to a week. In some cases the process may need to be repeated a little time afterwards to help reinforce the message. Separate the cats – keep your new cat in a separate room from the beginning. Allow them several days of getting used to their new environement. Swap scents – rub a clean towel over your new pet and then rub this towel around the rest of the house. On walls, furniture etc. This will allow your existing cat to get used to this new scent. Repeat the process the other way round, by transferring the scent of your existing cat to the room of the new cat. Allow a day or so for the cats to get used to this new scent before moving on. Affection – make sure that your new cat doesn’t become the focus of your time. It is important that your existing cat does not feel neglected, as this will increase their insecurities. Slow introductions – Put your new cat into a cat carrier that allows visual access and put the carrier in a room with your other cat. Stay in the room and let you cats see each other. There may be spitting and hissing, but do not react to this.This first encounter should only last a few minutes. Repeat the process daily, for longer and longer periods of time. Whilst the encounter is happening be sure to use a calm voice towards your cat and stoke them to reassure them that everything is ok.
Repeat - Repeat the process the other way round, with your existing cat in the carrier and your new cat outside. Gradually over time as the introducing cats process is repeated over and over again and the cats are exposed to each other for longer and longer periods of time, the cats reactions should become less and less aggressive as they get used to the sight and smell of each other. Once the aggression has subsided, it is time to introduce the cats without the carrier. Never leave them alone together during this time. Allow them to get to know each other in their own way. Offer the cats treats, so that they associate each other’s presence with a good experience.It’s all about making your cats realise that the other cat is not a threat and that they should not feel afraid. However if a full blown fight does break out, separate them, never shout, remain calm and try again later. Once cats have gone through this process of introduction in a calm and reassuring environment, they will eventually stop feeling threatened by each other and should stop reacting to each other in an aggressive way. The Introducing cats process can still be carried out even if the cats involved have known each other for years. Sometimes due to certain circumstances, cats can lose confidence in each other and begin to act aggressively towards each other. When this happens going through this introduction process with your cats can help restore the peace. It is important for your cats to feel that they have their own little part of the home which they can call their own. It is therefore important that as owners we provide each cat with their own things when introducing cats to the household. Litter tray – the trays should not be too close together. Feeding and water bowls – Again these should not be too close together and should not be near the litter trays. Bedding – Unless you are very lucky and have cats that like to sleep together, you will need to make sure you provide each cat with their own beds. Affection – make sure you spend equal amounts of time with each of your cats. 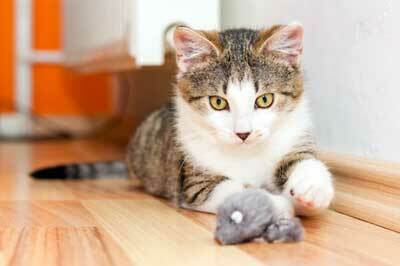 Playtime is a good bonding exercise and will make your cat feel a part of the family. This means that territory is of the highest importance to them. So the intrusion of another cat onto their territory is a threat to their food supply and mating precedence. This is why when introducing cats for the first time they generally feel threatened and react with aggression. However some cats are quite able to get on with other cats and pets in a domestic situation as many owners can testify. It is not unusual for many households to contain 2 or more cats, all who get along with each other reasonably well with perhaps just the odd spat as long as the food supply is plentiful, there is plenty of space and there is enough fuss and attention to go round. Why Can't Some Cats Get Along Together? Some cats however do find it very hard to accept another pet into their territory and this can mean fights and tension within the household and this can be very stressful for both cats and owners alike. The reason for this is all down to how the cat was introduced to other cats and animals from birth. The first 7 weeks of a cats life is known as the sensitive period and it is during this time a cat needs to meet lots of different animals, people and other cats so that they become far more accepting of them throughout their lives. 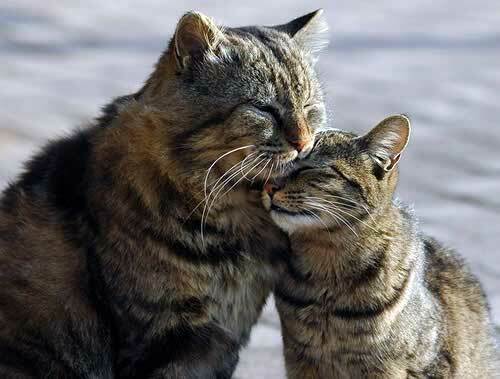 These cats have been used to sharing affection, food and living space, and so do not feel threatened when a new cat is introduced to their home environment. As long as the new cat feels the same way, they should get on together happily after a time. Of course the cats individual personality is also a factor and some cats are just simply loners or are a bit grumpy, in which case these cats should not be homes with other pets. 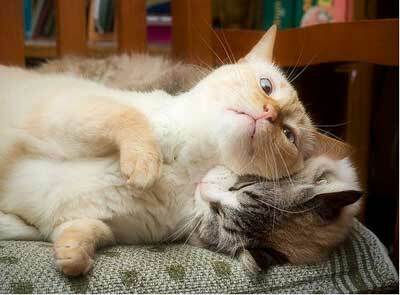 However, it may still be possible for two cats to get along amicably, even if they never become bosom buddies. It is important that cat owners take an active role in cat introduction to each other and make a real effort in helping to reassure their animals that there is nothing to be afraid of. But be warned do not have unrealistic expectations of what you want to happen. Sometimes it simply is not possible to make cats like each other and the best that you can expect is a sort of truce between them. Plus if you are anxious about the situation this will be sensed by the cats and could simply make the matter worse. Patience and calm is the order of the day in this situation. But What If They Never Get Along? Unfortunately I do hear of cases where owners have tried introducing cats to each other and they just won’t get along. Rather nasty fights may break out all the time, resulting in injury, or one of the cats to be terrorised by the other and so become a timid and frightened creature. In these cases I would say that the kindest thing to do for both of your cats is to re-home the newest cat into a home where they can regain their confidence and live a happy relaxed existence. Your existing cat will also benefit, as they will no longer feel threatened in their own home and can return to being the happy cat they once were. I realise this is a hard decision for owners to make, but never the less a very considerate one.